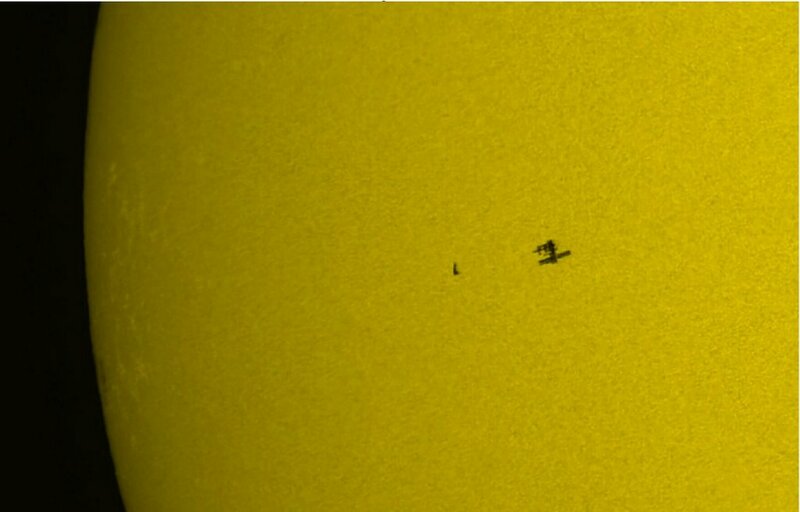 This amazing photo shows Atlantis and ISS silhouetted against the Sun. The "Faint Young Sun" has long been a paradox. Astrophysicists have developed detailed models of the Sun's evolution. According to these models life should not have evolved on Earth, because 4 billion years ago the Sun shone with barely 70% of its present luminosity. Earth's temperature would have been 15 degrees below zero centigrade and the planet woud have been frozen solid. Evolution of life would have been very unlikely. Geology shows evidence of sedimentation 4 billion years ago, indicating presence of rivers and seas. Other geological markers confirm the presence of liquid water. Paleontology dates the earliest organisms at least 3.4 billion and possibly 4 billion years old. Clearly water and life both existed when models say that Earth was frozen solid. The fact that life exists to read this post contradicts the standard solar model. This conflict with observations is the Faint Young Sun Paradox. "This amazing photo shows Atlantis and ISS silhouetted against the Sun." It is amazing. And you took it from Hawaii with which magic lens? In addition, the earth's core was hotter in the past because when you think about it, it has been cooling. A lot of the heat of the core is from radioactivity. Although U238 has only undergone one half life in the earth's life, many supernovae nuclides with short half lifes which are now extinct were around billions of years ago. U235 has a half life of 704,000,000 years and a present abundance of 0.71% in natural uranium. So 4.5 billion years ago, its abundance would have been 0.71% x 2^(4.5/0.704) = 60%. This is approaching nuclear weapons grade, so uranium ore seams would have been STEAMING HOT for many millions of years, regardless of the sun's output. "Fifteen natural fission reactors have been found in three different ore deposits at the Oklo mine in Gabon, West Africa. ... Calculating back to 1.7 billion years ago—the age of the deposits in Gabon—scientists realized that the U-235 there comprised about three percent of the total uranium. ... Once the natural reactors burned themselves out, the highly radioactive waste they generated was held in place deep under Oklo by the granite, sandstone, and clays surrounding the reactors’ areas. Plutonium has moved less than 10 feet from where it was formed almost two billion years ago." "Why was uranium so much more radioactive then? That is a deep question that points to the very origin of the solar system. The formation of the planets (and the Sun) from an original cloud of dust and gas apparently was triggered by the explosion of a nearby supernova. Only a supernova can manufacture elements heavier than iron, including uranium. With a half-life of 700 million years, U-235 started out making up nearly half of all uranium when the solar system began some 4560 million years ago. Many shorter-lived radioisotopes that existed in the beginning, like aluminum-26, have become extinct. We know of their former existence by the presence of their decay products in ancient meteorites—nuclear fossils." "It is often said that all the conditions for the first production of a living organism are present, which could ever have been present. But if (and Oh! what a big if!) we could conceive in some warm little pond, with all sorts of ammonia and phosphoric salts, light, heat, electricity, etc., present, that a protein compound was chemically formed ready to undergo still more complex changes, at the present day such matter would be instantly devoured or absorbed, which would not have been the case before living creatures were formed." So I don't think that even if the sun was dim all that time in the past, it matters very much for evolution, since there would be hot spots from uranium. Obviously there would also be volcanic eruptions and hot geysers, but generally these would be too sporadic and not constant enough to allow evolution to begin. Utilising heat from fission would be more likely to start life than solar energy, which is of course interrupted by the earth's spin. Chemical reactions starting due to solar energy in daylight would "come undone" at night, and so sunlight would be far less likely to trigger evolution than heat from a more constant, reliable source such as nuclear fission power. Ice glaciers do flow slowly and produce some effects which in the poor geological record from billions of years ago would not be too dissimilar from effects of water. Actually, I thought the answer was that the early Earth's atmosphere contained a great deal of methane. Methane is 20 times more potent than carbon dioxide as a greenhouse gas. Then, about 2.5 billion year ago, when photosynthetic organisms appeared and began pumping oxygen into the atmosphere, that combined with the methane and (after a few reactions) cleared it from the air, the result being the first "Snowball Earth" episode. The Earth did freeze from pole to pole. But volcanoes don't care that there are glaciers in their way and eventually enough CO2 built up again to melt the snowball. I got this from Miracle Planet on Discovery. Cool show. Nigel might be on to something because what he's suggesting is supported by the life found in very deep ocean vents where previously it was thought that life could never form and thrive. Personally, I like to imagine that this process is happening on other planets (or large moons) that we 'conventionally' believe are "too cold" (or too harsh, or whatever) for life to form. It's a fun thought anyway. Hello all. P&M, we need a telescope to take this shot, similiar to photographing sunspots. Nigel's contributions are good and thoughtful as always. Thanks for helping to answer M's questions too. Kelly, that is the standard answer but methane would have to custom-heat Earth to keep it in the narrow range necessary for life. Greater methane is only an inferrence, for there is no geological evidence supporting it. Rae Ann, that is a good point. The greater problem is that geology says that Earth's temp was higher too. Other stars resembling the young sun also show a lower luminosity. The Sun might say "when I was your age parameters were different." Hah, hah! I can see where this is going! Do you already have quantitative evidence for BHs? Right on Kea, maybe we'll get around to the solution of this paradox. I enjoyed your posts about AustMS 2006, since I've been writing about Aristarchus and Erastothenes. It is fascinating how much their measurements of distances and curvature relates to today. (and Type Ia are poorly understood). Custom heated? Not really. There was only bacterial life which is pretty tough so the required temperature range isn't narrow. They survived at least two snowball Earths, after all. Another factor ,to add to Nigels Posting, is that Cosmic Rays that react in our present atmosphere, would in the far distant past, born different reactions, based on the Atmospheric makeup of a dilute atmosphere? It is well proved that Cancer Cells are "triggered" by Radiation, this trigger effect, kicks the cells to grow, is not this an act of "life" mechanism, albeit in a Cancer Cell,radiation allows Cancer to prosper, it gives "life" to Cancer? The process of High Energy Cosmic Rays, is responsible for the first Thought in any evolving Conscious Humanoid, any Homosapian today that goes up high into a mountain range, and experiences Altitude sickness, coupled with a bombardment of Cosmic Rays, would experience "photon_flashing", one side effect is disorientaion of the senses. The early Nasa astronauts who spent time in orbit around Earth, came back complaining of "photon_flashing", as the HEP's interacted with Atoms in the EyE? Again the evidence was recorded during the images of Chenobyl Reactor Accident, where Oxygen Molocules in the surrounding air were dissrupted, and gave of the telltale signs of Radiactive Bombardment, clearly visable as blue flashes of light in the video footage of early news reports. The earth's atmosphere is a radiation shield equivalent to a shield of water 10 metres thick. This reduces the cosmic background radiation by a factor of 100 of what it would be without the earth's atmosphere. As you say, going up a mountain increases the cosmic radiation. Also, it changes the type of cosmic radiation, since heavy ions are stopped quickly in the atmosphere and don't usually penetrate to ground level. This is why astronauts observed random flashes in the retina when in space (in lightly shielded space vehicles). The background ionising radiation exposure rate measured on the Moon (no atmosphere) was 1 mR/hr at solar minimum (and a lot higher obviously during a solar flare, at least on the part of the Moon in line-of-sight of the sun at that time). The normal background ionising radiation at sea level over average soil is 0.02 mR/hr, of which about 0.01 mR/hr is cosmic radiation. "U235 has a half life of 704,000,000 years and a present abundance of 0.71% in natural uranium. So 4.5 billion years ago, its abundance would have been 0.71% x 2^(4.5/0.704) = 60%." This is wrong because I didn't allow in the quick calculation for the fact that 4.5 billion years ago the amount of U238 was twice as great (one U238 half life). So the true abundance of U235 at 4.5 billion years ago was less than 60%. The November 2005 issue of Scientific American, page 60, has a graph showing U235 was 25% of total uranium at about 4.5 billion years ago. It also shows that the current natural abundance of U235 is not 0.71% but nearly 0.72%.